Despite our busy schedules, cooking together is a priority for Jack and me. As soon as we get home from work, we hit the kitchen and scour the fridge. Jack loves looking up new recipes online, while I like to stick to classic family recipes. Tonight, we decided to do a bit of both. Using my mom's famous, decadent lasagna recipe, we changed a few ingredients to make it light and healthy. The result? YUM. I hope you enjoy it as much as we did! Chop vegetables and place into a skillet with hot oil. Add desired seasoning. Cook until vegetables are tender. Add pasta sauce. Simmer 5-10 minutes. Mix cottage cheese and egg in a separate bowl. Add desired seasoning. Layer ingredients in pan. 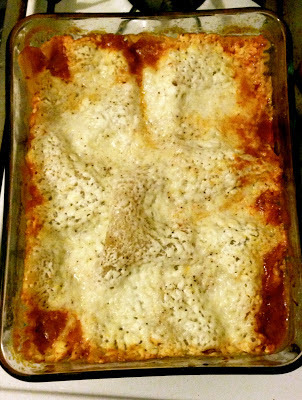 Start with a layer of sauce, followed by a layer of lasagna noodles. Then add a layer of cottage cheese mix, followed by a layer of mozzarella cheese. Continue this sequence until the pan is full. Finish with a layer of sauce and a sprinkling of mozzarella cheese. Add desired seasoning. Cover with tinfoil. Bake at 350 degrees for 55-60 minutes. ... In the mood for garlic bread too? So were we. But a healthy version. Our fix? We used low-calorie bread with a low fat yogurt butter spread. We topped it off with parmesan garlic seasoning and let it bake in the oven for five minutes. Delish!